Sunday, Nov. 18, 42 A.B. Enough About Your Cheese - Who Moved MY November?! So, here it is - another mostly sunny day with a temperature in the 60s. Although sunny warmth has a way of lulling my lizard-brain into pleasant slumbers, the neurotic little man who lives under the rock that lizard is on will have none of it. "Something's wrong!" that neurotic little man is screaming. "This isn't the way November used to be! This isn't the way it's supposed to be! The desert is spreading across Morocco while you sleep and blink and sleep some more! Mosquitoes are evolving in bad ways! Allergies and asthma are plaguing more and more Americans as the pollen-producing season starts earlier and ends later year after year! HUGE icebergs are breaking off a shrinking Antarctic ice cap! Glaciers are retreating faster than ever before! WAKE UP! Alert the president! Demand bombing runs be launched against atmospheric greenhouse gases immediately - NOW! BEFORE IT'S TOO LATE!" I do not follow sports teams. Have I mentioned this before? Or have I kept this info carefully hidden for fear that it will conclusively prove me to be the foreign-born girlie socialist so many have long suspected me of being? No matter. The time has come to reveal all, and part of that all is the fact that I do not follow sports teams. Well, Hoover Reservoir is special. It's the one closest to my home. It's the only one that I've actually seen. It's by far the largest, with its 8-mile length covering almost 9 times the acreage of the Griggs Reservoir. It supplies Columbus with two-thirds of its drinking water. And it's 9.19 feet below overflow. Talk about having an off season! I dread to open the paper tomorrow for fear of learning that Hoover's been traded away to Indiana for three wading pools and a bottle of Perrier to be named lately. I try to imagine what it really means to be 9.19 feet below overflow. If I were that far below my current level, my head would be more than 3 feet lower than the top of the hole I'd necessarily be standing in. If I went to the store and tried to buy enough wrapping paper to cover a box holding the water required to raise a 3272-acre reservoir even 1 foot, I'm sure I'd faint when the clerk told me my final cost even if she gently whispered it. Let's see (masochist that I am).... If I used cheap brown paper that costs, say, $1.99 per roll, and each roll covers 37.5 square feet like the unopened roll in my garage claims it does, and there are 142,528,900 square feet in 3272 acres.... seems I would need at least 3,800,771 rolls of paper, costing $7,563,534.29 (plus tax). And then I'd still have to buy the tape, as well as an appropriate card. Do any companies even make cards appropriate for reservoirs? If you can remember any reservoir-appropriate cheers from your high school or college days, please pass them along! City workers finally came and sucked up my leaves on Friday - they DID!! And *I* got to watch!!! Ohhhh, I've never in my entire life seen 120,000+ leaves sucked up faster. Less than 30 seconds, maybe - 4000 a second?? (Ecstasy has such a way of distorting one's time sense!) The truck kept moving the whole time about as fast as an elderly man can walk. One city worker directed the foot-wide hose while another used a rake to help stray leaves find their way into it. I feel it safe to say that no woman on earth has ever appreciated a 30-second thrill more after days and days of building anticipation and need. I'm actually getting light-headed all over again just thinking about it! Meteor Shower? What Meteor Shower? Did you see the much ballyhooed Leonid meteor shower last night? Did you find any evidence at all on your sidewalk or driveway this morning that there'd even been one? Me neither. I didn't think I would, having been misled by numerous astronomical forecasts in the past, but I made sure my patio table umbrella was safely tucked away in my barn before I went to bed all the same. It's really starting to show its age, after all, and the last thing I need is to have even one shooting star come down and pop a hole in it. The fabric's so thin now that even a small shooting star would have gone right through, I'm sure. As it is, well... guess I can stop feeling guilty about not having spent part of last week raking the stars into a single pile I could easily keep an eye on. I fully intended to, but after discovering just how much time and energy it took to rake 120,000 leaves into a pile, I just couldn't quite motivate myself to tackle the 20 billion stars in the Milky Way galaxy alone. Maybe if I hadn't recently overheard a couple at a restaurant saying that an apparently empty area of the sky no bigger than a grain of sand held at arm's length was found by the Hubble Space Telescope to harbor more than 1500 other galaxies. 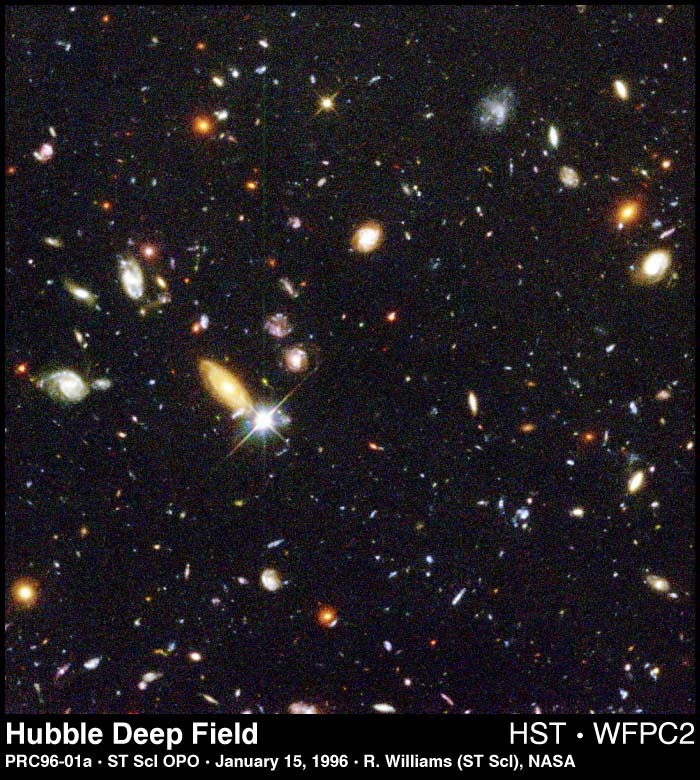 If YOU can look at one small slice of what the Hubble saw and can then summon up the will to grab a long-handled rake, you're a better man than I am. And who knows - you might even be a better foreign-born girlie socialist if it means you have to put down your sports section to do so.